We spend a lot of our time daydreaming and planning trips; it’s a symptom of the travel bug we are both infected with. Multiple trips are regularly organized and we choose the best one that fits our schedule at the time. We also stumble across things that just cannot be ignored, but have to wait for future travels. The posts below are the result of internet wanderings and unfinished plans. These are trip ideas we have been thinking of, lists of places we would like to go and collections of useful information. We publish them in the hope they may be of use to others. I’ve always been fascinated by volcanoes. The pure creative (and destructive) power of them just shows how powerful earth actually is, and that we are living on an active planet. Beneath our feet, under the super thin crust, is a huge boiling “fireball” of partially molten rock just waiting to come out. With that in mind, I’ve always had a list of volcanoes I’ve wanted to visit. Luckily, I’ve seen a couple but not enough! Here is my wish list of active* volcanoes, including the ones I have visited. *Active is a very subjective term in volcanology, here I am defining it as currently spewing (technical term…) lava or erupting large amounts of ash, or having done so in the very near past and likely to do it again in the next year or two. There are a myriad of definitions related to volcanism, I use a few in the text above that may be unfamiliar (although I did try and keep it non-technical). Magma: A mixture of molten or semi molten rock and other constituents (like gases/volatile components) found beneath the earths surface. Lava: Molten rock expelled by a volcano during eruptions. So essentially magma becomes lava when it leaves a volcano. Basalt: A magma/lava that is relatively low in the mineral silica and has a high temperature of over 1000oC. It is less explosive and less viscous that other lava so readily makes lava flows and fountains. Lava lake: A lake of molten lava situated in the crater of a volcano. Stratovolcano: A conical volcano built of layers of ash, lava and other ejecta. The “quintessential” volcano you imagine as a child. Situated in “the heart of darkness” this volcano already has mythical connotations. Add in the roiling, boiling lava lake in the active crater, the largest of only five “permanent” ones in the world, and you can see why it is such a draw. It is located in Virunga National Park on the eastern extreme of the DRC, a country that has struggled with war and lawlessness for decades. Occasionally relative calm descends on the region and the park is re-opened, and for the first time in years the volcano is once again open. It is out-of-the-way and expensive to see but when adding the almost pristine forest, “cheap” gorilla and chimp permits and current lack of tourists the extra hassle of getting there is worth it. The national park, aware of the difficulties, can organise everything including: travel to and from the park, rangers, “luxury” accommodation and visas for those intrepid enough to want to go. This volcano has been on my list to see for years but now it is once again visitable I am already making plans to go in the near future. See http://visitvirunga.org for more information on costs and how to book. Mount Etna rises 3,329m over southern Sicily, snow capped and more often than not glowing red. Eruptions from the stratovolcano are intermittent and varied but catch it at the right time and it is certainly one of the most accessible ways of seeing one of earths most spectacular sights. Most eruptions occur away from the crest and channel down the Vallee del Bovee on the south eastern side of the volcano, sometimes these can be seen from the towns on the coast, such as Taormina. To get to the top you can drive through the pines on the lower slope and catch a cable car, then on to the top by large wheeled bus. Alternatively you can do what I did and stay at a refuge at around 2000m and walk the whole way up. To see the lava flows up close you will probably need a guide but there are plenty of walks through alien landscapes full of cinder cones, older flows and ash you can do yourself. If you’re lucky you may find one of the many lava tubes to explore, but mind the bats! When Krakatoa exploded in 1883, tearing apart what was once a fairly sizeable island, it caused huge tsunamis and killed more than 36,000 people. The noise was heard more than 3,000 miles away and the shock wave resonated round the world. Inside the huge caldera a new island began to form. Anak Krakatoa, or “Child of Krakatoa” is the manifestation of the current volcanism in the area and formed from Strombolian (continuous, low level ejections of pumice and ash) eruptions. Since 1994 the island has been in almost continuous eruption mode, with ash and lava bomb (but very few lava flows) ejections occurring almost daily ever since. The island is now a major tourist attraction and boat trips can be organised from both Jakarta and towns further north. While not technically an active volcano itself, the whole island is essentially a volcanologists paradise. The entire island is formed by volcanism as the island is an above sea level part of the mid Atlantic ridge, the divergent (separating) plate boundary between the Eurasian and North American plates. It is the only place in the world you can “see” the plate boundary. Thingvellir, a large fissure running north-south is supposed to be particularly spectacular. You can even scuba dive it at Silifra. The reality is the boundary is a diffuse area that runs over a large part of Iceland, but it’s a place to go none the less. There is invariably a volcano erupting somewhere on Iceland at one point in time, be it Eyjafjallajökull that grounded planes all over Europe in 2010 or more viewable volcanoes like Bardarbunga that started erupting in August last year and is still ongoing at the time of writing, producing firey basaltic lava fountains and flows. Volcanoes in Iceland aren’t themselves explosive due to the magma they eject, however many are beneath glaciers and ice. When the melting ice mixes with extruding magma the steam produced causes spectacular eruptions from the ice. This was the cause of the huge “ash” cloud that grounded flights during the Eyjafjallajökull eruption. Volcano tours are big business in Iceland so you should be able to find an guided trip; alternatively there are a multitude of places to walk over the barren landscape and marvel at the power of volcanism. We plan on doing a 3 week trip to see this island. Natrocarbonatite volcanoes are rare. In fact there is only one currently active volcano in the world: Ol Doinyo Lengai, “The Mountain of God”. It towers 2962m over the Tanzanian Rift Valley and views are apparently stunning from the top. Carbonatite magma contains much higher proportions of carbon and much less silica (a major part of Quartz) than other volcanoes. This means the extruded lava is much cooler than other lavas, at around 510 degrees Centigrade, and is black in daylight before turning white when cooled. Eruptions are sporadic at this volcano, with the last being in 2013, however there have been numerous events over the last 10 years so it can certainly be classed as active. Guides can be hired to take you up to the crater to see any activity, the cooled lava and the views over the Rift Valley. If/when I go to see this volcano I will probably integrate it with a trip to the other major sites in Tanzania, although it is apparently quite a ways from any of them. I will definitely take a detour to see it. Much like Iceland, it’s not technically a single volcano, rather a whole chain of volcanic islands sourced from a hotspot in the earths mantle. The long chain of islands and sea mounts are a testament to the movement of the Pacific plate over this Hawaii hotspot through geological time, creating over 129 volcanoes. The most famous of the active volcanoes is Kilauea, on Hawai’i itself, with the latest eruption starting in 1983 and continuing ever since. The continued activity has had some human consequences, with the low viscosity lava flowing miles and essentially unstoppable, destroying fields and houses in its wake. Fortunately due to that low viscosity it is very easy to predict where the lava will head next, giving plenty of time to evacuate affected areas. That predictability means there are few more accessible volcanoes to see lava flows in the world, especially for North Americans. There are numerous tour operators you can book through to get up close and personal. Vanuatu: A small island chain in the South Pacific, it has multiple active volcanoes. Two, documented by the recent BBC programme “Kate Humble: Into the Volcano”, are Yasur: with an almost continuous explosive eruptive history of over 300 years, and Ambrym: one of the few with a permanent lava lake. Stromboli: 30 miles off the coast of Sicily this island has been erupting almost continuously for 2000 years. Strombolian eruptions mean there is little lava but occasionally it can be seen. Otherwise ash, steam and volcanic bombs are what you will see. 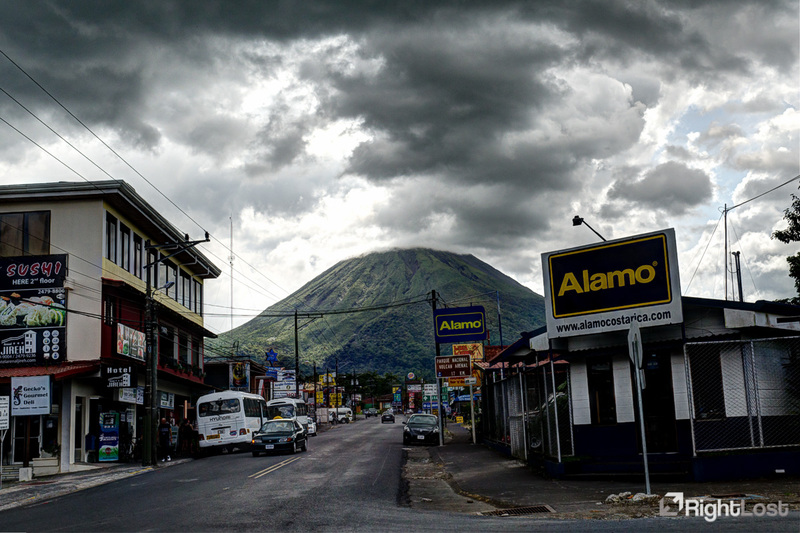 Arenal: Located next to La Fortunate in Costa Rica this stratovolcano hasn’t erupted since 1998, but it’s on the list because I’ve been there… It stands proud above the town and is a great example of a stratovolcano, steep sided with a single crater. You can’t climb it but you can climb Cerro Chanto, the extinct volcano to the south. It’s a great walk (no need for a guide) through tropical forest and you end up overlooking a large crater lake, which is recommend you don’t swim in. Mayon Volcano: In the Albay Province of the Philippines is the “perfect cone”, a volcano with an almost perfect conical shape, much like Arenal above. The last activity was September 2014 but this volcano is probably best seen when not erupting, several eruptions have been very explosive, causing problems for those living around it. Have you visited a volcano that is worth mentioning? Feel free to post your comments below. A Geologist by trade, Andrew loves travelling and photography, especially to wild and natural places. He needs to pay for it by working full time so until he and Verena can travel the world full time he has become a specialist in creating as much travelling time as possible from their annual leave.